Seahorse Guest House01493 843361work Guest HouseEnjoy award-winning customer service at the Seahorse Great Yarmouth. This licensed Guest House enjoys a quiet location but is just two minutes’ walk from the Sea Life Centre on Marine Parade and close to all major attractions. We have a range of single, twin, double and family rooms, all of which are en suite. So, whether you’re looking for a family holiday, a romantic break or a home from home whilst working away then the Seahorse Guest House has something that will suit you. All rooms are light and airy with ample storage space to make for a comfortable and relaxing stay. The majority of our en suites have baths, making them ideal for cleaning up small sandy people after a tiring day on the beach or a luxurious soak after a long day! All rooms have WiFi, colour TVs, hairdryers and tea and coffee making facilities and are serviced daily. Our young visitors all receive a goody bag upon arrival, which should keep them occupied long enough for you to get unpacked! We pride ourselves on our home cooked breakfasts which are served in the dining room between 8am and 9.30am, or earlier by arrangement. We provide a choice of breakfast to suit all appetites and, where possible, we use locally sourced produce. Everyone is different and we do our best to make sure that each guest gets the type of experience that they want. We also offer an evening meal option so you don’t need to venture out at the end of the day. We are lucky enough to have both a dining room and separate lounge bar area which makes meal times a relaxed experience and means that there’s scope for pre dinner drinks and to take your tea and coffee in a more comfortable setting. 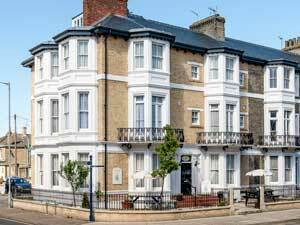 Enjoy award-winning customer service at the Seahorse Great Yarmouth. This licensed Guest House enjoys a quiet location but is just two minutes’ walk from the Sea Life Centre on Marine Parade and close to all major attractions. Freeview TV. Facilities for children: Cots, highchairs and childrens meals. Children welcome from any age. From A14 or A12. Turn off seafront opposite Wellington Pier-bear right. 1st left. Keep seafront on your right and turn left into Camperdown Seahorse Guest House is on your right hand side on the corner of Camperdown & Nelson Road south. From Great Yarmouth - 2 miles. No public transport, taxi only.